Action folds to Brett Murray in the small blind and he limps in, prompting a check from Stephen Song in the big blind. The flop comes , Murray checks, Song bets 80,000 and Murray calls. The turn is the and both players check to the on the river. Both players check again and Murray tables for a pair of sevens to take down the pot. In the next hand, Nick Pupillo opens to 200,000 from under the gun, Murray three-bets to 525,000 on the button and Pupillo mucks. Action has been fairly snug, but Nick Pupillo is putting on a clinic raising the majority of hands in the last few orbits. Pupillo is pulling away from the pack, with Stephen Song sitting on the shortest stack. Scott Sanders opens to 180,000 on the button and Brett Murray defends his big blind. The flop comes , Murray checks, Sanders bets 140,000 and Murray calls. The turn is the and both players check to the on the river. Both players check again and Murray tables for two pair aces and sixes to rake in the pot. Murray is now nursing the shortest stack after taking the chip lead early in the day. Scott Sanders raises to 140,000 from under the gun and Nick Pupillo calls on the button. The flop comes , Sanders bets 125,000 and Pupillo calls. The turn is the , Sanders checks, Pupillo bets 300,000 and Sanders quickly calls. The river is the and Sanders checks again. Pupillo wastes no time and fires out a bet of 675,000. Sanders mucks. Action folds to Brett Murray in the small blind who jams into the short stack Stephen Song, in the big blind. Song openly holds up his hole cards and announces "call." Song completes the flipping over of his cards to reveal . Murray has . They are both surprised at the strength of the hands in a blind vs. blind situation. The board runs out . Song holds and doubles his 660,000. The very next hand Murray is on the button. He raises to 150,000. Song, in the small blind this time, moves all in. Scott Sanders lays down his big blind and Murray enters the tank. He asks for a count. The sum comes out to 1,350,000. "It's close," Murray states while agonizing over a decision. Eventually, he drops in some chips to call and is dismayed when he sees Song's . Murray tables . "I need that jack," says Murray. The flop comes . Murray does indeed get the jack, but at the same time Song pairs his ace. The turn and the river are the and , respectively. Murray hits the wrong side of Big Slick again. Song has now doubled through Murray two hands in a row and once again has chips to play with. Stephen Song opens to 140,000 from under the gun and Nick Pupillo three-bets to 455,000 from the small blind. Song asks to see Pupillo's stack and then moves all in. Pupillo snap-calls for 2,385,000. Pupillo is at risk with , up against Song's . The board runs out and Pupillo gets a clean run-out to double up. Brett Murray opens to 150,000 on the button. Stephen Song calls in the small blind, as does Scott Sanders in the big blind. The flop comes . Song and Sanders check. Murray continues with 175,000. Song calls. Sanders gets out of the way. Both players check the turn. The river is the . Song bets 200,000 and Murray folds. With about 700,000 in the pot on a board reading , Brett Murray leads out for 250,000 and Stephen Song calls. The river is the and Murray thinks for a moment before firing out a bet of 675,000. Song doesn't think for long before putting in the call. Murray tables for trip nines and Song mucks. Murray now holds a sizable lead. Day 3 is underway with just four players remaining in the Main Event, playing down to a winner today. The Main Event gathered up 442 entries at Harvey's Lake Tahoe, and just four players remain coming in to Day 3 today at Noon. Day 2 began with 54 players and dropped right down to four with Stephen Song leading the way. Song sits on 3,880,000 and looks to add a Main Event ring to the $400 NLH Turbo ring he won on his day off on Saturday after bagging the Main Event on Day 1A on Friday. He is in contention for the Casino Champion title, and also has a chance at a seat if he wins the Main Event today. Close behind Song is three-time WSOP Circuit champion Brett Murray with 3,800,000. He went on a tear on Day 2 and never looked back. Murray looks to win his second Main Event since taking down the Thunder Valley Main Event this past September. Scott Sanders is third in chips with 3,525,000 and looks to win his second ring after taking down the Monster Stack right here in Tahoe just a few days ago, also in contention for Casino Champion. 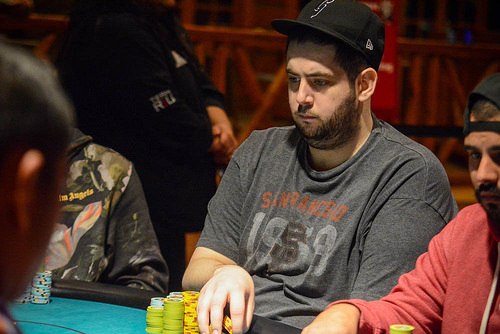 Finally, Nick Pupillo has his sights on his third career ring and sits in fourth with 2,105,000 chips. Among the final four, there are a total of seven Circuit rings among them. Play begins at Noon with Level 28 and blinds at 30,000/60,000 with a 10,000 ante and will conclude once a winner is crowned.